There’s a link between heart health and oral health that not everyone knows about yet. The truth is, your oral health can provide clues about your overall condition – and this is especially true when it comes to your heart. Many of the risk factors for gum disease are the same as the ones for heart disease. These include tobacco use, poor nutrition, and diabetes. This means that if you have a chronic gum condition, you may be at higher risk of a heart attack. Symptoms and warning signs of gum disease include red and swollen gums, bleeding gums, receding gums, bad breath, and loose teeth. Inflammation is a problem in both conditions. Because clots decrease blood flow to the heart, this increases your risk of heart attacks and strokes. Some studies say that people with chronic gum disease have thicker blood vessels in their neck, so there could be anatomical connection as well. Is There a Direct Link Between Oral Health and Heart Disease? Although research hasn’t yet determined if a direct links exists between gum health and heart health, studies have shown that gum disease is a risk factor for coronary artery disease and for diseases of the blood vessels and arteries that supply the brain. They’ve shown links between gum disease and clogged arteries in the leg, as well. However, a fully vetted connection has been, so far, difficult to prove. However, it does show that if you treat your teeth and gums for symptoms of periodontal disease, your overall health may improve. 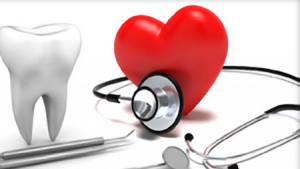 More research is needed to fully understand the relationship between oral health and heart disease, but indications are good that a connection exists. This means that regular visits to your dentist, and paying attention to your oral health isn’t just great for your smile, it may also yield unexpected dividends in terms of heart health, too. This entry was tagged gingivitis, gum disease, heart disease, oral health. Bookmark the permalink.